Note: This is the online help of an old version. Please try the latest version. No matter what reason you want to invert your input to the browser, you can do it with this extension now. It can invert the input of a text field or a password field. After you input something into a text box, right click your mouse to pop up the context menu where you can see an item of "Invert Input". Click it and the text will be reversed. The background color of the text box will be changed to navy color to indicate that the text has been reversed. If you do the inverting again, the text will return to original, but the color of the font will be set to navy with a white background color. This reminds you that you have run even times of the function to make it return to original. If you prefer keyboard shortcuts, you can use Ctrl-Shift-I to invert the input while the cursor is in that text box. To answer the request from some users, a new option to open inverted URL is added to version 2.0. To use it, you must first enable it on the Options dialog (See the Options section). Then you can highlight the inverted URL and right-click to select "Open Inverted Link" from the context menu. The inverted URL will be opened in a new tab. If you right-click on a link and choose "Open Inverted Link", the address of the link will also be reversed and opened in a new tab. In version 2.0, a new option "Handle inverted link" is added. 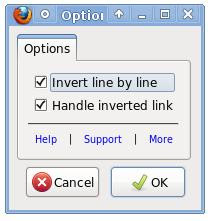 By checking it, you enable the "Open Inverted Link" on the context menu when you right-click a highlighted text, or when you right-click on a link. The highlighted text or the address of the link will be reversed and opened in a new tab.